When you walk up to the Cafe Souvenirs you automatically get drawn into its warm atmosphere and attention to detail which is one the many things that makes it unique. Although I will likely mention the terrace another 2 times, I really suggest you enjoy a seat on it since there is nothing quite like it on a sunny afternoon. The attention to detail is amazing with small unique things that set it apart. 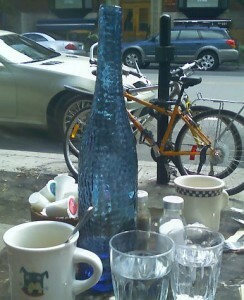 The glass bottles of water on your table are each a different colour and shape (there’s even one that looks like the tower of Pisa) as are the coffee mugs. Inside the cafe the hooks for jackets are actually golf club tops; it sounds odd but it works. One should also note that there is wifi available although don’t be a camper and stay there for 4 hours because line ups form. The main criticism is the lineups; when it’s grey and snowing it’s not an issue, although when the sun is out, there is a big lineup forming for a small amount of tables and the patrons can get aggressive; you have to be on your A game to make sure you get a seat and clearly communicate with the hostess who is often overworked running from table to table. My tip is get there early or get comfy (you can use the park bench nearby). Now onto the food. Not to be outdone by the decor the menu is pretty solid, it is not a laundry list of choice although almost every item on the menu is a hit. Even before you get to choose your food you get taken in by the amazing look of the menu. Basically it’s a collection of travel photos and looks like a passport sized scrapbook of images and places. To begin with the coffee is amazing; I think we went through 7 cups, and could have had more. The omelette Souvenir ($10.25) is legendary; it comes served onto your plate by the waitress in an iron skillet and it’s slightly crispy on the sides but still tasty and fluffy (but not too fluffy). 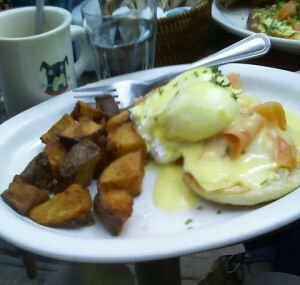 The smoked salmon Benedict ($13.00) is a solid choice and comes with a side of potatoes. 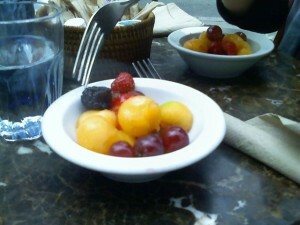 Both options came with a complimentary small fruit bowl; I don’t recall this from the last few times I went so I think this is new. 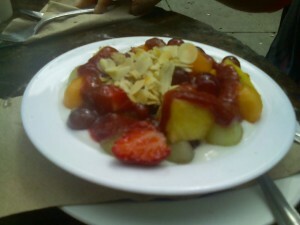 The Yogourt bowl ($4.25 – $6.75) comes with fruit and a choice of sliced almonds or fruit coulis (a coulis is a thick sauce made from fruit puree). There are also crepes ranging from butter and sugar ($3.00) to the Souvenir ($10.00) which comes with Belgian chocolate, fresh fruit and Chantilly ice cream. These same flavours apply to the French toast except that the prices are $1-$2 more. The taste of the plates is very good, the price is a little more expensive than it should be, but when you factor in the area, ambiance and taste it makes it worth while. Service is good, our waitress was attentive and came around frequently, although they were understaffed and the hostess doubles as a waitress making the lineups for the terrace extra bad. Coffee refills were frequent (and trust me we had a lot of coffee) and the bill came in a timely manner. Most plates are Veg friendly and the omelettes are very tasty and fully veg, although if you are looking for vegan options the only thing you can have is the fruit plate. For some reason there are never enough of those little bowls with milk,cream and sugar; we had to borrow from the table next to us and share with another. This always happens and I don’t know why they don’t just order more, but it is a nice way to meet your neighbours. The lineups for the terrace are long and can be difficult, kind of like holding 6 seats for a movie premiere. we showed up early and got a seat with minimal waiting, although we were 2 and I had my A game on for marking my seat territory. Even if it is winter you should not pass up on this place as it can simply become a favourite destination quite easily. I should also note that Outremont has its own weird parking rules and the parking meter attendants love to give tickets. Mon- Fri 7 A.M. – 11 A.M.
Sat-Sun 7 A.M. – 4 P.M. 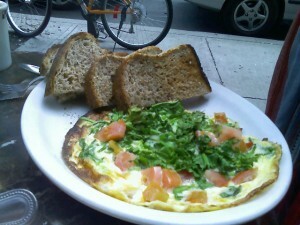 I agree: their over-baked made-to-order omelette (choice of 3 ingredients) is fantastic. … sorry, I meant “OVEN” baked, not over-baked! They’re delightfully crispy and makes you never want to have a pan-fried omelette again.